Can suma root help with fat loss? Two recent questions were asked about Suma Root on my article about its various health benefits. But my question is, does suma root (10gramms, 3 times a day) really helps on gaining muscle mass and lose fat or not? If you were to purchase it – where would you go? Its always a question to ensure you are getting quality stuff with true bioavailability and not just wasting your money. It seems you wrotr this article almost a year ago – any new info since? I’ll address both of these here. Disclaimer: I am not a licensed doctor and this does not constitute medical advice. If you have any specific questions about your particular situation please contact a licensed health professional. To be honest, I’m not sure that suma is an especially good herb for either of these two goals, although there’s a little bit of evidence that it might help a tad with regards to both…..but probably not a whole lot. There’s little reason to think Suma root will help you build muscle. To the best of my knowledge there has never been a study conducted that demonstrated an ability for suma root to acheive this goal. Going beyond that……is there anything about the chemical composition of suma root that might lead one to believe it could help someone build muscle? Here the answer is the same, although there’s a little more room for hope. The biologically active part of the suma plant is found in its roots, and they contain two phyto-steroids called ?-sitosterol and stigmasterol, which are anabolic (muscle building) compounds. So there’s a reason to believe suma root might increase levels of testosterone in the body, but I’m only basing that statement on one study that alluded to such an effect. (The gated version is here). However, in the grand scheme of things this effect is likely to be modest. If you’re looking to bulk up then there are probably better ways to go. My approach to nutrition doesn’t center around getting bigger, so you’d honestly be better off asking someone else about the best supplements to take to achieve the desired effect. Suma root isn’t “ergogenic”, which means it doesn’t inherently make the body burn more calories. However, it does seem to be good for improving cellular health. It increases the body’s ability to adopt to metabolic stress and perform better under intense conditions, but that’s not necessarily the same as fat loss, per se. To be honest, I wouldn’t recommend suma root to someone if they were only looking to burn fat or build muscle. It is very good for you, but suma all by itself doesn’t really help you do either of those things. However, as a supplement to a workout regimen it’s probably a very useful herb. It’s known as an “adaptogen” which is a type of compound that allows the body to better react to stress. More about that here. Adaptogens have a good track record for improving different cellular functions. And finally Alfred, it’s important to consider the importance of dosage. 10 grams a day/3x a day is A LOT OF SUMA ROOT! Yipes! Be careful man! Most of the studies done on suma are used with dosages between 200-600 mg/day. About 1/100th of what you’re taking. That’s abnormally high dosage, to say the least. Suma root seems to be safe at moderate quantities, but at very high dosages (which are lower than what you’re taking!) it might cause nausea and metabolic dysfunctioning. Any useful effects of suma are found at much lower amounts than what you’re taking. So for your own sake……take it easy! With regards to Amir, there are a few important points to consider when buying Suma. It natively growns in Brazil but can also be sourced from China or Japan, among other places. StarWest Botanicals and Mountain Rose Herbs. I use Mountain Rose Herbs for most of my bulk herb purchases, but StarWest has a good reputation for quality and deliberately state that they source their suma from Brazil. 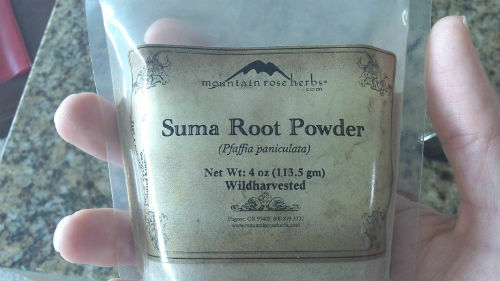 You can usually buy either suma root or the powdered form of the root. If you buy the raw root then its best to boil it in water and drink it like tea. If you buy the powder then I’d recommend adding it to tea separately or mixing it with smoothies/shakes. 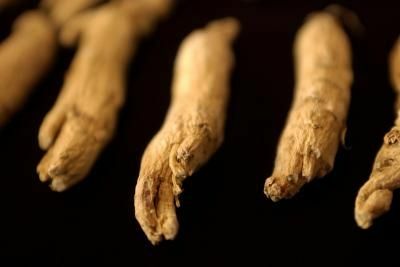 You can also buy the root extract which is a little more potent, but the concentration will vary. So with all this discussion about what Suma Root does and doesn’t do, and how to buy it, what should you use Suma Root for? However, like I noted in my original article there’s not a lot of research on Suma compared to other foods and it is by no means a cure all. So use it to improve your health, but don’t put yourself in harms way. Suma has a chemical called allantoin that tends to inhibit tumor cell growth. Also, Suma is high in germanium, which carries oxygen through the blood across cellular membranes into the cell. So it potentially could have benefits in preventing some forms of cancer. From my experience it is a good adaptogen for fighting stress and low oxygen levels. Thanks for this…..this is all news to me so I’m always thankful when readers can impart this kind of unique information. I’ve read that studies showed beneficial effects at daily doses of about 300-500mg of Ecdysterone which is the active component (phyto steroid) of suma (for about 5 days). Also looking around I see that suma root typically contains 0.66% of Ecdysterone. So by that measure we are looking at a daily consumption of 45g – 75.8g which is a little over the 30g that the poster Alfred was using. Huge differences but perhaps real results only occur after getting enough of that ecdysterone?